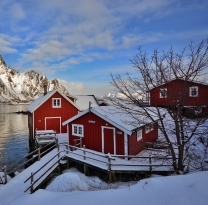 Lofoten has justifiably been described as one of the most scenic archipelagos in the world and in winter it can certainly be one of the most dramatic. A long and rich cultural heritage dates back to the Vikings who settled in the region and it has long provided an inspiration to artists who relish the opportunity to capture the unique landscape and light. It was also here that Joanna Lumley finally fulfilled her lifelong dream and witnessed the dancing hues of the Aurora Borealis. Fly to Tromsø in the heart of the Aurora zone. Transfer with the ‘Flybuss’ to the Clarion Collection Hotel With for 1 night. A light buffet supper is served until 9pm. Take time to explore the Arctic capital. The Polar Museum, Polaria and Arctic Cathedral lead the cultural charge. Try a Macks Brewery tour, lunch in one of the myriad of fish restaurants or indulge in an afternoon tea of hot waffles and brown cheese. At 17.00, head off on a husky adventure. 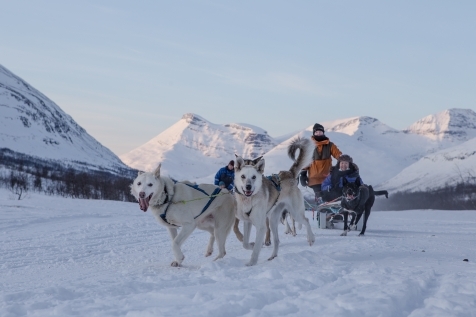 A 90 minute transfer transports you through the surrounding snow-covered wilderness for a husky safari and a chance to see the Northern Lights. A light snack is served in a traditional Lavvu. Returning to Tromsø, there is just enough time for a late night drink before heading to the Hurtigruten terminal in time for the 01.30 southbound Hurtigruten ship. Overnight on board. Enjoy a leisurely breakfast on board. 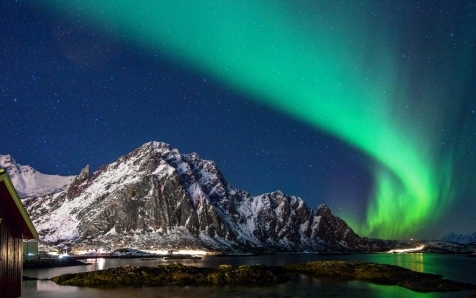 Hurtigruten has traversed the Norwegian coast for over 120 years, passing sheltered bays and glorious mountain landscapes, all visible through the panoramic windows of the ship. There is a short stop at Stokmarknes, before continuing through the Raftsund, a picturesque and narrow channel between the Vesterålen and Lofoten islands. Arrival in Svolaer is scheduled for 18.00. Disembark and it is just a short transfer to Svinoya Rorbuer. Overnight in a converted fisherman’s cabin on the shores edge. 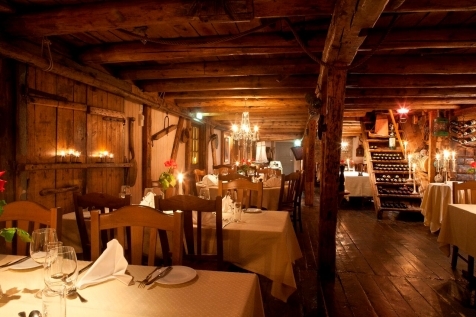 Enjoy a welcome dinner in the atmospheric ‘Børsen Spiseri’, a quayside warehouse dating back to 1828. 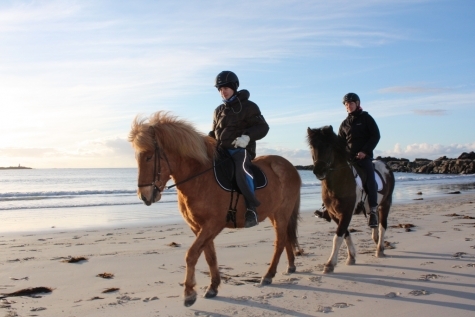 After breakfast, the day is free for you to choose from the optional additional excursions on offer. Each evening we have included a guided Northern Lights search, where you will be taken to the best locations in order to spot this amazing natural phenomenon. The Clarion Collection Hotel With has a waterfront location near the Polar Museum, Mack’s Pub and Brewery and the Arctic Cathedral. Warm Scandinavian décor and friendly staff add to the charm of this property. Upgrade to harbour view rooms for fantastic views. Complimentary afternoon waffles and light evening buffet supper included. Svinoya Rorbuer is located on an island in the heart of Svolvaer Harbour, linked by bridge where a short 10-15 minute walk brings you into the heart of the town. Comprising of 30 renovated or newly built Rorbu cabins with various internal configurations these cabins are reminiscent of the original fisherman’s homes but with bathrooms, shower/WC, kitchenette and sitting room. Breakfast, lunch and dinner are served in Borsen Spiseri, an atmospheric converted quayside warehouse offering unique fresh and local ingredients. Explore the dramatic coastline and historical villages that make up this archipelago by bus.There will be a number of photo stops along the way so you can capture the breathtaking views. A traditional fisherman’s lunch is included. Join a winter RIB safari adventure along Trollfjord to the local nature hot spots and a close encounter with the white tailed sea eagle. Tour Available: Various depending on month travelling. Please contact us for full availabilty. 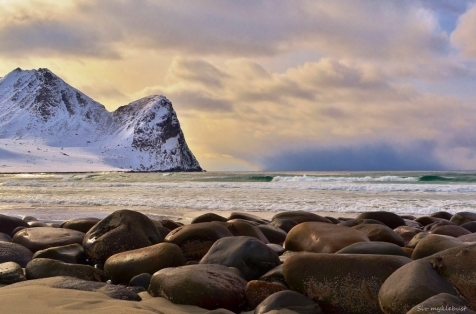 Learn more about the marine life in Lofoten starting with a lecture and presentation on the local flora and fauna before boarding the safari boat in search of the real thing. Lunch on board. Tour Available: Selected departure dates, please contact us for further information. Snowshoe hike into the surrounding nature with a local guide. Transfer to and from a suitable location included.